It’s an escapist read. It’s like taking a little holiday to the west of Ireland, ridding yourself of all technology and getting back to basics. It’s a lot of fun but there are definitely darker elements to it, which hopefully will keep the reader interested to find out what exactly is going on on the mysterious island of Hy Brasil. There is something entirely captivating about The Enchanted Island: there’s elements of mystery and intrigue, the development (and almost growing up) of Maeve, and of course a decidedly sweet romance to boot. What was the inspiration for the novel? Thank you. It’s lovely to hear my book being described as captivating. The island itself was my inspiration. For a long time I had a vision in my head of a small row boat navigating treacherous seas to get to this sinister, unfriendly place. I wrote the first chapter a few years ago. It was like I was on that boat trying to get on the island for a long time to see what was going on, and finally last year I went ashore. I really wasn’t sure where the story would go. Ultimately I had to decide on what would make the islanders so unwelcoming. I knew they had to have a secret. And it had to be big enough and devastating enough for them to sacrifice everything to protect it. We see a lot of development in Maeve throughout the story, what one character trait will most endear her to your readers? What was your biggest challenge in writing The Enchanted Island? The plot! I hadn’t fully figured out the plot when I started writing, I thought it would come to me along the way. And while parts of it did trickle down, a lot of it didn’t, and I spent a long time stuck trying to unravel a number of potential plot lines before realizing the ending. What research did you undertake in writing The Enchanted Island? I read a lot of books about life in isolated communities. It’s really interesting to see how isolation breeds unique culture, language and idiosyncrasies. I also travelled back to Ireland last year and visited the Aran Islands off the west coast of Ireland, which are so ruggedly beautiful they take your breath away. They’re a community steeped in history and tradition, and there are plenty of books written about them, so I was lucky to have lots of material to draw on. I’m lost in a sea of nappies at the moment. I just had my second baby, a divine little boy, so life is wonderful and exhausting at the same time. What’s next for me is to get a full nights sleep eventually and when I come up for air, and a glass of Chardonnay, I will get back to my third book which I started writing a few months ago. Early days, but I’m excited about it. Ellie O’Neill is a born and bred Dubliner who worked in advertising for years before taking the unprecedented risk of quitting her job and moving back in with her parents at thirty something to write her first novel Reluctantly Charmed. She then got taken by complete surprise and fell in love. She came out to Australia on a long romantic holiday (what does a girl have to do to get a second date?) which turned into a six year stay. She currently lives in Geelong, with her still romantic partner Joe, toddler Cian and new born Hugh. The Enchanted Island is her second novel. When Maeve O’Brien’s boss sends her to a dreary old island to finalise some paperwork, she couldn’t be happier. It’s the career boost she needs to become a fully-fledged lawyer – besides, it hasn’t been so great on the home front in Dublin. Maeve’s oldest friend and flat-mate has kicked her out, and moving back in with her uptight mother has been less than cosy. But her reception on Hy Brasil, a remote island off the west coast of Ireland, couldn’t be any more hostile – it’s as if the island itself wants her gone. The locals are all ancient – and spookily well preserved – and they’re all so nasty. And what is that terrible screaming noise that echoes around the island? But no island is going to scare Maeve off, even if she does miss her credit card, and her make-up, and bright shiny nightclubs, and the one night stands. She’s determined to track down Sean Fitzpatrick, the elusive islander, whose signature on Maeve’s paperwork is going to transform the island and open it up to the world. And then, somehow, life begins to change. The island might be miserable and treacherous, but it’s also beautiful and strangely seductive. Maeve’s never felt better. And there’s also Killian, the dreamy teacher, who stirs up all kinds of unexpected feelings in Maeve. 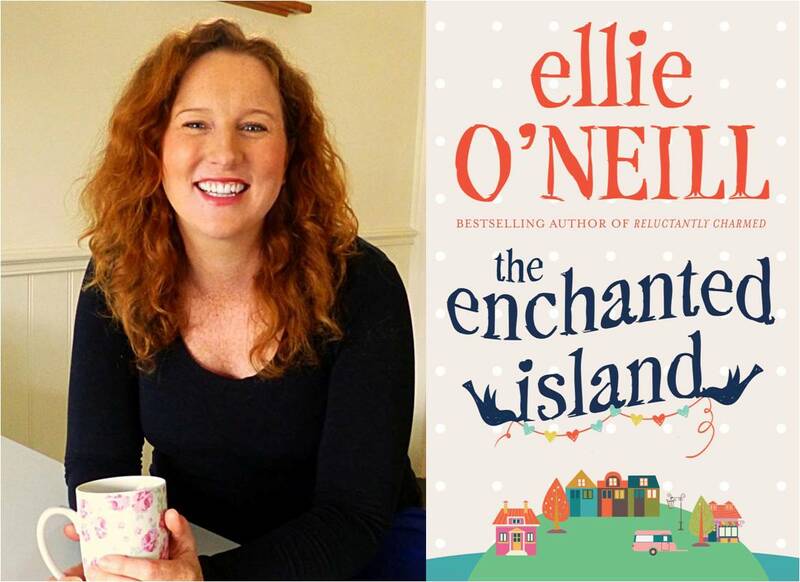 To WIN one of five paperback copies of Ellie O’Neill’s The Enchanted Island thanks to Simon and Schuster Australia, simply head to the AusRom Today Facebook page and click on the link!